Portion of Spirit's first 360-degree image. Image credit: NASA/JPL/Cornell. Less than two weeks ago, at 11:35 PM, January 3, 2004, the unmanned US spacecraft Spirit landed on Mars. Launched by the National Aeronautics and Space Administration (NASA) on June 10, 2003, Spirit carried with it a robot geologist called a rover that will be used to explore the surface of Mars. Spirit's twin spacecraft, Opportunityalso carrying a roverwas launched July 7, 2003 and will reach Mars on January 25. The two rovers will be used to examine the rocks and soils of the Martian surface to see if there has ever been waterand therefore possibly lifeon Mars. In honor of this momentous accomplishment, this month D-Lib Magazine is featuring the NASA/JPL web site Mars Exploration Rover Mission by presenting a few images from the site along with a bit of interesting information about the mission. We hope that you will be enticed to visit the Mars Exploration Rover Mission web site soon and often. Spirit's launch, landing and subsequent operations have been directed by a team of scientists from government and academia, based at the Jet Propulsion Laboratory (JPL), a division of the California Institute of Technology. These scientists communicate with the rover using the Deep Space Network (DNS), an international network of antennas that supports interplanetary spacecraft missions. The DNS transmits commands to spacecraft and brings back the images and other scientific data that enable scientists to explore Mars without having to leave Earth. The Mars Exploration Rover Mission web site makes it possible for those of us who are armchair "astronauts" to follow the mission as it progresses. The web site offers information on all facets of the Mars Rover Mission, past, present, and future, making use of multimedia, image galleries and many pages of full text features. 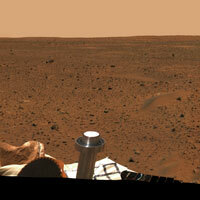 In addition, the Mars Rover Mission web site offers daily press releases and photographs. As one example, there is a January 8 press release about high school students who are official participants of the Mars Rover Mission, some of whom were in the control room at JPL when Spirit landed. As one of their tasks, these students electronically process calibration images to add hour markings, and then provide the enhanced images online to illustrate how time and celestial motion are measured by a scientific instrument called the MarsDial, a specially constructed type of sundial. 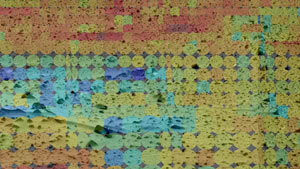 The image used on D-Lib's table on contents page this month is one of the student-enhanced MarsDial images. The image shown at the top of this page is from a January 12 press release and is of "The first 360-degree color view from NASA's Spirit Mars Exploration Rover [that] presents a range of tempting targets from nearby rocks to hills on the horizon." 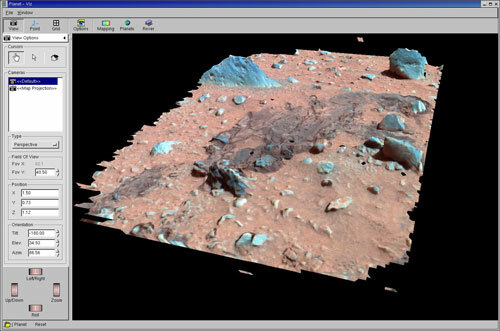 A three-dimensional color model created using data from the Mars Exploration Rover's panoramic camera shows images of airbag drag marks on the martian surface. Image credit: NASA/JPL/Cornell. During its landing on Mars, Spirit used airbags to cushion the spacecraft and prevent a hard impact with the Martian surface that might have damaged Spirit's sensitive scientific equipment. These airbags had to be inflated seconds before landing and then deflated once Spirit was safely on the ground. The screen shot above illustrates how data communicated to the mission team from Spirit was used to create a photo-like model of "drag marks" made by the airbags when Spirit landed. Another image (see at right on this page) from the Mars Exploration Rover Mission site shows the Martian terrain through the eyes of the Mars Exploration Rover Spirit's mini-thermal emission spectrometer. This spectrometer detects the infrared light, or heat, emitted by objects. In the image, different colored circles show a spectrum of soil and rock temperatures, with red representing warmer regions and blue, cooler. Among other things, scientists and engineers will use the data provided by the spectrometer to plot a safe course for the rover, free of loose dust. Spirit's landing and subsequent operations have gone almost without a hitch, and if all continues to go well, by the time you read this the rover could already have disembarked from the spacecraft to begin its exploration of Mars. Why not visit the site now to find out if the rover is succeeding in its mission? The Mars Exploration Rover Mission web site is located at http://marsrovers.jpl.nasa.gov/home/index.html.